Los Angeles, CA, United States (4E) – Despite the drama surrounding Rob Kardashian and Blac Chyna , her son is out with her baby daddy, Tyga , and Kardashian’s half-sister, Kylie Jenner as they enjoyed a day out at Six Flags Magic Mountain. According to reports, the outing was on Sunday afternoon. Jenner was spotted wearing casual clothing as she wore black leggings, black shirt, minimal make up, and had her hair down. The 18-year-old made her way around the park with Tyga and his son as they enjoyed the rides. 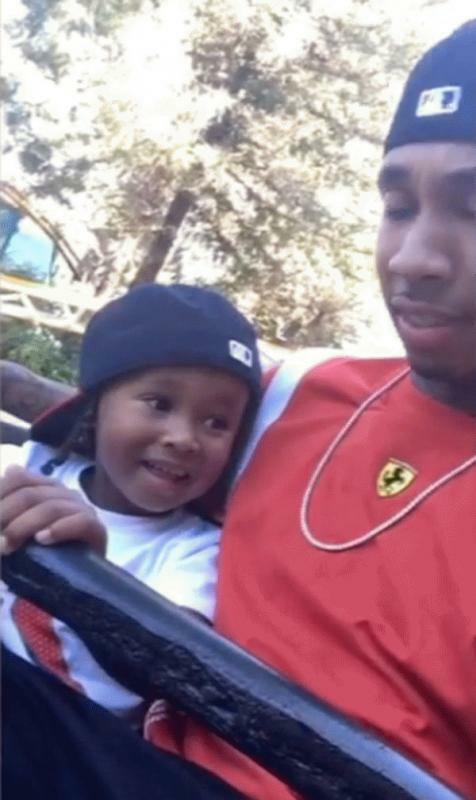 Tyga posted a photo of him and his son on Snapchat showing the toddler all smiles as he sat close next to his dad. It seems that the photo was taken while they were on one of the rides of the amusement park. The father and son duo looked like they were twinning as they both had their basketball caps worn backwards. Witnesses said that King Cairo got on one of the rides alone as he boarded a miniature monster truck. In the photos posted by Jenner , King Cairo was not seen in any of them and Tyga also posted photos of him with his son during their day out. Jenner has also sparked engagement rumors after she posted a snap of a diamond ring. She captioned the image simply with “bae spoils” but has not answered the questions about a possible engagement. An insider shared, "No they are not engaged! The pathetic thing is that Tyga did not even buy Kylie this diamond ring! He doesn't really buy her anything and she gets all of her jewelry on her own. Most of the stuff is gifted to her." She also posted a photo last month showing her with Tyga and she captioned it with “Mr & Mrs.” Fans wondered if they secretly got married. The snap has since been deleted.